Artem Pustovyi Highlights vs Joventut 28.10.2018. Artem Pustovyi scored 11 points, 1 block and helped Barcelona to beat Joventut at home in OT 94-92. Kevin Seraphin Highlights 12 Pts vs Joventut 28.10.2018. Check out Kevin Seraphin best highlights against Joventut with 12 points and 1 block. FC Barcelona Lassa 94 - 92 Divina Seguros Joventut 28.10.2018 ACB Liga. Kevin Pangos leads the way with 32 points and 4 assists to help Barcelona to beat Joventut at home in OT 94-92. CSKA Moscow vs Parma 29.10.2018 VTB League. CSKA Moscow beat Parma at home 108-84, Daniel Hackett scored 12 points and 3 assists. Baskonia beat on the road Estudiantes, Darrun Hilliard played 13 minutes and scored 12 points and 3 rebounds. Tornike Shengelia Highlights 18 Pts vs Movistar Estudiantes 28.10.2018. Tornike Shengelia led Baskonia to a win over Estudiantes with 18 points and 2 rebounds. Anadolu Efes 89 - 83 Fenerbahce 25.10.2018 Euroleague. Jan Vesely almost got a triple-double with 27 points, 7 assists and 8 rebounds against Anadolu Efes in Euroleague. Rodrigue Beaubois scored 17 points, 4 assists and 1 block in the win over Fenerbahce. Nizhny Novgorod 75 - 88 Lokomotiv-Kuban Krasnodar 27.10.2018 VTB. Moustapha Fall best highlights 10 points, 5 rebounds abd 2 blocks against Nizhny Novgorod. Nizhny Novgorod 75 - 88 Lokomotiv-Kuban 27.10.2018. Isaiah Whitehead had a great game against Nizhny Novgorod with 23 points, 4 assists and 2 rebounds. Real Madrid 90 - 77 San Pablo Burgos 28.10.2018. Gabriel Deck scored 11 points, 2 assists and 6 rebounds against San Pablo Burgos. Real Madrid 90 - 77 San Pablo Burgos Liga Endesa J6. Sergio Llull led Real Madrid to win over Burgos with 19 points, 4 assists and 3 rebounds. Euroleague: Gran Canaria 91 - 106 CSKA Moscow 26.10.2018. CSKA beat Gran Canaria on the road, Cory Higgins scored 17 points, 4 assists and 1 block. Sergio Rodriguez Highlights vs Gran Canaria 26.10.2018. Sergio Rodriguez scored 11 points, 8 assists and 5 rebounds against Gran Canaria 26.10.2018. Herbalife Gran Canaria 91 - 106 CSKA Moscow 26.10.2018. Alec Peters scored 15 points, 5 rebounds and 1 assist against Herbalife Gran Canaria. Herbalife Gran Canaria 91 - 106 CSKA Moascow 26.10.2018. Nando De Colo led CSKA to a win over Gran Canaria 106-91, scoring 22 points. 6 assists and 4 steals. Dairis Bertans Highlights vs Khimki Moscow 25.10.2018. Dairis Bertans scored 16 points and 1 assist against Khimki Moscow, Euroleague. Olimpia Milan 80-81 Khimki Moscow 25.10.2018 Euroleague. Jordan Mickey had a great game against Milan with 26 points, 7 rebounds, 1 block and 1 assist. Olimpia Milano 81 - 80 Khimki Moscow 25.10.2018 Euroleague. Mike James led Milan to the win over Khimki Moscow, scoring 25 points, 8 assists and 2 rebounds 25.10.2018 Euroleague. Jalen Reynolds Highlights 21 Pts vs Valencia Basket 24.10.2018. Jalen Reynolds led Zenit to the victory over Valencia Basket with 21 points, 2 blocks and 2 assist. Eurocup: Zenit 104-93 Valencia Basket 24.10.2018. Valencia was defeated on the road by Zenit, Matt Thomas scored 22 points and 1 assist. Zenit Saint Petersburg 104 - 93 Valencia Basket 24.10.2018. Brandon Jannings had a double-double against Valencia Basket, scoring 11 points and 12 assists. Pierria Henry scored 21 points, 4 assists and 7 rebounds vs Unicaja Malaga 23.10.2018. Unicaja Malaga 82 - 80 Unics Kazan 23.10.2018 Eurocup. Maurice Ndour scored 14 points, 6 rebounds and 3 blocks. Unicaja Malaga 80 - 82 Unics Kazan 23.10.2018. Bryant Roberts scored 14 points and led Unicaja to the victory. CSKA Moscow vs Kalev 22.10.2018. CSKA took care of business at home on Monday, dispatching Kalev by 27 points - 102:75. Will Clyburn scored 17 points, 6 rebounds and 1 assist. Othello Hunter scored 19 points, 8 rebounds and 1 block against Kalev. CSKA Russian defeated Kalev Estonia at home, 102-75 (31-14, 23-24, 23-19, 25-18). VTB League: Parma 70 - 80 Khimki Moscow 22.10.2018. Tony Crocker had a great game against Parma with 21 points, 2 assists and 1 block. Parma 70 - 80 Khimki Moscow 22.10.2018. Dee Bost led BC Khimki to a win over Parma, scoring 22 points and 5 assists in the VTB League. Nes Ziona 74 - 90 Hapoel Jerusalem 21.10.2018. James Feldeine scored 14 points and 2 assists against Nes Ziona on 21.10.2018. Valencia Basket 85 - 86 Barcelona Lassa 21.10.2018. Matt Thomas had a great game against Barcelona Lassa, he scored 27 points, 2 assists and 3 rebounds, but Valencia was defeated at home 85-86. Chris Singleton Highlights 20 Pts vs Valencia 21.10.2018. Barcelona beat Valencia Basket on the road 86-85, Chris Singleton scored 20 points, 2 blocks and 1 assist. Buducnost VOLI 68 - 78 Maccabi Tel Aviv 18.10.2018 Euroleague. Scottie Wilbekin named co-MVP Euroleague round3, scoring 28 points and 5 assists. Gran Canaria 106 - 80 Morabanc Andorra 20.10.2018 Liga endesa. Check out best highlights of Anzejs Pasecniks with 14 points, 2 assists and 4 rebounds. D.J. Strawberry Highlights 17 Pts vs MoraBanc Andorra 20.10.2018. DJ Strawberry led Gran Canaria with 17 points, 6 rebounds and 3 assists against Andorra. Herbalife Gran Canaria beat Morabanc Andorra 106-80 liga endesa jornada 5. Dylan Ennis Highlights 22 Pts vs Gran Canaria 20.10.2018. Herbalife Gran Canaria defeat Morabanca Andorra at home 106 - 80 in the Liga Endesa jornada 5. Dylan Ennis scored 22 points, 6 rebounds and 1 block. Jordan Mickey Highlights 12 Pts vs Anadolu Efes 19.10.2018. Jordan Mickey of Khimki Moscow scored 12 points, 4 rebounds and 1 block against Anadolu Efes in the Euroleague round 3. Anthony Gill Highlights 15 Pts vs Anadolu Efes 19.10.2018. 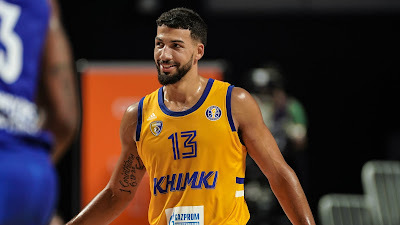 Khimki Moscow was defeated by Anadolu Efes at home 84-85, Anthony Gill scored 15 points and 2 assists. Khimki Moscow 84 - 85 Anadolu Efes 19.10.2018. Andien Moerman almost got a double-double with 12 points, 9 rebounds and 1 block against Khimki in the Euroleague round 3. Rodrigue Beaubois Highlights 26 Pts vs Khimki 19.10.2018. Rodrigue Beaubois named co-MVP Euroleague round 3, Beaubois led Anadolu Efes to a big win over BC Khimki 85-84, scoring 26 points and 4 assists. Alexey Shved Highlights 25 Pts vs Anadolu Efes 19.10.2018. Khimki Moscow was defeated at home by Anadolu Efes 84-85 in Euroleague round 3. Alexey Shved scored 25 points and dished out 6 assists against Efes. Real Madrid 97 - 79 KirolBet Baskonia 19.10.2018 Euroleague. Sergio Llull led Madrid to a victory over Baskonia 97-79, scoring 23 points and adding 4 assists. Marcelinho Huertas Highlights 14 Pts vs Real Madrid 19.10.18. Real Madrid 97 - 79 Kirolbet Baskonia, Euroleague round 3. Marcelinho Huertas scored 14 points and 3 assists against Real. Ray McCallum Highlights 14 Pts vs CSKA Moscow 18.10.2018. CSKA Moscow beat Darussafaka 80 - 75 in Euroleague round 3. Ray Mccallum scored 14 points, 7 rebounds, 2 assists and 1 block. Ante Tomic Highlights 18 Pts vs Bayern Munich 18.10.2018. Barcelona defeat Bayern at home 83 - 73 Euroleague, Tomic led Barca with 18 points, 5 assists and 5 rebounds. FC Barcelona vs FC Bayern Munich 18.10.2018. Chris Singleton scored 15 points, 5 rebounds and 1 block in a win against Bayern Munich. Barcelona Lassa beat Bayern 83 - 73 Euroleague round 3. Nikola Milutinov Highlights 23 Pts vs Baskonia 17.10.2018. Olympiacos beat Baskonia on the road 85-80, Nikola Milutinov named MVP Euroleague round 2 with 23 points, 11 rebounds and 1 assist. Baskonia 80 - 85 Olympiacos 17.10.2018 Euroleague round 2. Jayson Granger scored 17 points, 2 assists and 3 rebounds against Olympiacos Piraeus. Tornike Shengelia Highlights 21 Pts vs Olympiacos 17.10.2018. Kirolbet baskonia 80 - 85 Olympiacos Piraeus, Euroleague round 2. Tornike Shengelia had a great performance against Olympiacos with 21 points, 4 rebounds, 1 assist and 1 block. Maccabi Tel Aviv 86 - 89 CSKA Moscow 16.10.2018 Euroleague. Kyle Hines had 14 points, 4 rebounds and 1 assist in the win against Maccabi Tel Aviv. Tarik Black Highlights 15 Pts, 2 Blk vs CSKA Moscow 16.10.2018. Maccabi Tel Aviv was defeated at home 86-89 by CSKA Moscow in Euroleague round 2. Tarik Black had 15 points, 7 rebounds, 2 blocks and 1 assist on 16.10.2018. Nando De Colo led CSKA to a big win on the road with 27 points, 5 assists and 3 rebounds. Isaiah Whitehead Highlights 18 Pts vs Unics Kazan 14.10.2018. Lokomotiv-Kuban was defeated on the road by Unics Kazan 79-75 in the VTB League. Isaiah Whitehead had 18 points, 4 assists and 4 rebound on 14.10.2018. James Feldeine Highlights 25 Pts vs Maccabi Rishon 13.10.18. Hapoel Jerusalem pick up a big victory at home over Maccabi Rishon 94 - 73 in the Winner League. James Feldeine led the Hapoel with 25 points, 6 assists and 8 rebounds. Darrun Hilliard Highlights 24 Pts vs Fuenlabrada 14.10.2018. Kirolbet Baskonia crushed Fuenlabrada on the road 60 - 110 in the Liga Endesa round 4. Darrun Hilliard led Baskonia to the victory and finished with 24 points, 2 assists and 2 rebounds. Gabriel Deck Highlights 15 Pts vs Joventut 14.10.2018. Real Madrid crushed Divina Joventut 92 - 69 in the Liga Endesa round 4, Gabriel Deck helped with 15 points, 5 rebounds and 14 assist. Olimpia Milano beat Buducnost Voli on the road 71-82, Nemanja Nedovic led Armani team with 14 points, 5 assists and 5 rebounds in the Euroleague round 1. Will Clyburn Highlights 19 Pts vs Nizhny Novgorod 13.10.2018. CSKA Moscow defeated Nizhny Novgorod at home 84 - 78, Will Clyburn led army team to the victory with 19 points, 8 rebounds, 2 assists and 2 blocks. CSKA Moscow 84 - 78 Nizhny Novgorod 13.10.2018. Othello Hunter scored 12 points, 2 blocks and 5 rebounds against Nizhny in VTB League. Facundo Campazzo Highlights 15 Pts vs Joventut 14.10.2018. Real Madrid 92 - 69 Divina Joventut ACB Liga Endesa round 4. Facundo Campazzo led Madrid to win with 15 points, 5 assists and 5 rebounds on 14.10.2018. Pau Ribas Highlights 20 Pts vs Zaragoza 13.10.2018. Dylan Ennis Highlights 36 Pts vs Manresa 13.10.2018. Morabanc Andorra was defeated at home 77-82 by Baxi Manresa. Dylan Ennis was on fire 36 points, 3 assists and 48 PIR! Anthony Randolph Highlights 16 Pts vs Darussafaka 11.10.2018. Real Madrid started new Euroleague season with an easily win 109-93 over Darussafaka. Anthony Randolph led Madrid with 16 points and 3 assists. Ray McCallum Highlights 18 Pts vs Real Madrid 11.10.2018. Real Madrid started its title defense by routing EuroCup champion Darussafaka 109-93. Ray McCallum paced Darussafaka with 18 points and 6 assists. Aleksandar Vezenkov Highlights 13 Pts vs Khimki 12.10.2018. Olympiacos Piraeus started new Euroleague season with 66-87 road victory over Khimki Moscow. Newcomer of Olympiacos Alexandar Vezenkov scored 13 points, 2 assists and 4 rebounds. Anthony Gill started new Euroleague season with 13 points against Olympiacos. Khimki Moscow 66 - 87 Olympiacos 12.10.2018 Euroleague. Olympiacos BC pick up the victory on the road over khimki moascow 87-66, Anthony Gill scored 13 points and made 1 block in the first Euroleague game of the new season 2018-19. Anzejs Pasecniks Highlights 12 Pts vs Fenerbahce 12.10.2018. Fenerbahce Istanbul 97 - 72 Herbalife Gran Canaria 12.10.2018 Euroleague. Fenerbahce Istanbul beat 97-72 Herbalife Gran Canaria. Anzejs Pasecniks scored 12 points and 3 rebounds in the first Euroleague game. Jan Vesely Highlights 19 Pts vs Gran Canaria 12.10.2018. Fenerbahce Istanbul led from start to finish en route to a 97-72 win over EuroLeague debutant Herbalife Gran Canaria. Jan Vesely starred with 19 points, 11 rebounds and 3 assists in less than 22 minutes, to lead the reigning EuroLeague runner-ups in this victory. Euroleague: Fenerbahce 97 - 72 Herbalige Gran Canaria 12.10.2018. Fenerbahce crushed Gran Canaria at home 97 - 72 in the Euroleague RS round 1. Nikalo Kalinic was one of the best player from turkish team, he scored 16 points ad added 3 assists. Euroleague: Khimki Moscow 66 - 87 Olympiacos 12.10.2018. Olympiacos Piraeus beat BC Khimki on the road 87-66 in the Euroleague RS round 1, Alexey Shved was on fire with 34 points, 6 assists, 1 block and 2 rebounds. Zach LeDay scored 14 points and 5 rebounds against Khimki Moscow, Olympiacos defeated BC Kimki on the road 87-66 in the Euroleague round 1. CSKA Moscow 95 - 75 Barcelona Lassa 11.10.2018. Check out best plays from Kyle Kuric of Barcelona with 15 points against CSKA Moscow in Euroleague rs round 1. CSKA Moscow 95 - 75 FC Barcelona Lassa 11.10.2018. Cory Higgins led CSKA Moscow to the easy win over Barcelona Lassa 95 - 75, scoring 18 points, 2 assists and 5 rebounds in the Euroleague RS round 1. Nando De Colo helped CSKA Moscow to beat Barcelona Lassa 95-75 with 17 points, 2 assists and 5 rebounds on 11.10.2018 Euroleague regular season round 1. Norris Cole Highlights 34 Pts, 8 Ast vs Novgorod 09.10.2018. Norris Cole started the Basketball Champions League 2018-19 season off on the right foot! During the Gameday 1 match-up against Nizhny Novgorod, Cole led Sidigas Avellino to a 93-100 victory, he ended his night with 34 points, 8 assists, 5 rebs & 2 stl. Shane Larkin Highlights 16 Pts vs Galatasaray 07.10.2018. Galatasaray lost to Anadolu Efes at home 70-73 in the BSL round 1. Shane Larkin led Anadolu Efes to the victory with 16 points and 5 assists. Anthony Gill Highlights 21 Pts vs Enisey 08.10.2018. Alexey Shved Highlights 20 Pts vs Enisey 08.10.2018. BC Khimki overcame Enisey on the road 99-67, Alexey Shved scored double-double with 20 points, 11 assists and 1 block for the winners. Maurice Ndour Highlights 18 Pts vs Avtodor 07.10.2018. Unics Kazan beat Avtodor Saratov at home 76-63 in the VTB League round 1. Watch Maurice Ndour best performance with 18 points, 4 rebounds and 1 assist. Othello Hunter Highlights 18 Pts vs Astana 07.10.2018. Astana 61 - 86 CSKA Moscow VTB League round 2. Othello Hunter Led CSKA to a win with 18 points and 6 rebounds. Tarik Black Highlights vs Maccabi Ashdod 07.10.2018. Maccabi Tel Aviv crushed Maccabi Ashdod 103-59 in the Winner League round 1. Tarik Black near to double-double 11 points, 9 rebounds, 2 blocks and 1 assist. Giorgi Shermadini Highlights 13 Pts v Real Madrid 07.10.2018. Unicaja Malaga was defeated on the road by Real Madrid 89-82, Giorgi Shermadini scored 13 points, 3 rebounds and 1 block. Walter Tavares Highlights 14 Pts v Unicaja 07.10.2018. Real Madrid overcome Unicaja Malaga 89-82 in the Liga Endesa round 3 on 07.10.2018. Walter Tavares led Madrid to a win with double-double 14 points, 11 rebounds and 4 blocks. Nicolo Melli Highlights vs Besiktas 06.10.2018. Nicolo Melli almost got a double-double scoring 14 points, 9 rebounds while adding 2 assists. Kostas Sloukas Highlights vs Besiktas 06.10.2018. Fenerbahce won Besiktas 78 - 73 in the round 1 of BSL. Kostas Sloukas led Fenerbahce with 16 points and 4 assists. Barcelona Lassa 67 - 63 Morabanc Andorra 07.10.2018. Morabanc Andorra was defeated on the road by Barcelona lassa 67-63, Dylan Ennis scored 13 points, 2 assists and 1 block. Chris Singleton Highlights 16 Pts vs Andorra 07.10.2018. Barcelona Lassa beat Morabanc Andorra 67-63 in Liga Endesa round 3. Chris Singleton led Barca to a win with 16 points, 5 rebounds, 1 block and 1 assist. Othello Hunter Highlights 15 Pts vs Enisey 05.10.2018. Othello Hunter led CSKA Moscow to the big win on the road 97-66 with 15 points, 7 rebounds and 1 assist in the VTB League round 1. Nando De Colo Highlights 14 Pts, 5 Ast vs Enisey 05.10.2018. CSKA Moscow beat Enisey on the road 66-91 in the 1st round of VTB League on 05.10.2018. Nando De Colo scored 14 points and added 5 assists in 16 minutes. Valencia Basket 70 - 88 Real Madrid 05.10.2018. Bojan Dubljevic highlights 15 points & 2 assists against Real Madrid. Real Madrid defeat Valencia basket on the road 88-70 on 05.10.2018 ACB Liga Endesa round 2. Bojan Dubljevic of Valencia Basket almost got a double-double with 15 points and 9 rebounds. Walter Tavares Highlights vs Valencia 05.10.2018. Check out best highlight from Walter Tavares with 10 points and 4 blocks agaibst Valencia Basket 05.10.2018 Liga Endesa ACB round 2. Anthony Randolph Highlights 14 Pts vs Valencia 05.10.2018. Watch Anthony Randolph almost got a double-double with 14 points and 9 rebounds in a win over Valencia Basket. Real Madrid beat Valencia on the road 88-70 on 05.10.2018. Sergio Llull Highlights 17 Pts, 6 Ast vs Valencia 05.10.2018. Real Madrid defeat Valencia Basket on the road 88-70, led by Sergio Llull with 17 points and 6 assists. Brandon Jennings Highlights 15 Pts vs Lokomotiv 05.10.2018. Check out best highlights from Brandon Jennings of Zenit with 15 points and 3 assists against Lokomotiv-Kuban in the 1st round of VTB league on 05.10.2018. JaJuan Johnson Highlights 12 Pts vs Zenit 05.10.2018. Watch debut highlights from JaJuan Johnson of Lokomotiv-Kuban with 12 points against Zenit St. Petersburg. Lokomotiv crushed Zenit 96-64 on 05.10.2018 VTB league round 1. Adrien Moerman Highlights 13 Pts vs Fenerbahce 03.10.2018. Adrien Moerman drops 13 points and added 9 rebounds in the Anadolu Efes win 65-62 over Fenerbahce 03.10.2018. Kostas Sloukas Highlights 24 Pts vs Anadolu Efes 03.10.2018. Check out Kostas Sloukas lead all scorers with 24 points to go with 5 assists for the Fenerbahce Istanbul. Anadolu Efes defeat Fenerbahce 65-62 and won Turkish Super Cup. Raymar Morgan Highlights 14 Pts vs Mornar Bar 03.10.2018. Watch debut highlights from Raymar Morgan with 14 points, 5 rebounds and 1 assist in the Eurocup round 1. Unics defeat Mornar on the road 97-74 on 03.10.2018. Maurice Ndour Highlights 29 Pts vs Mornar Bar 03.10.2018. Maurice Ndour led Unics Kazan to a big win on the road 97-74 over Nornar Bar in the Eurocup round 1. Ndour scored 29 points, added 8 rebounds and 2 assists. Brandon Jennings Highlights 20 Pts vs Turk Telekom 03.10.2018. Watch fantastic debut highlights from Brandon Jennings of Zenit with 20 points, 8 assists and 9 rebounds in the win 91-80 over Turk Telekom on 03.10.2018 Eurocup round 1. Mathias Lessort Highlights 16 Pts vs Rytas Vilnius 02.10.2018. Eurocup: Mathias Lessort debut highlights 16 points and 1 block with Unicaja Malaga against Rytas Vilnius in Eurocup on 02.10.2018. Dylan Ennis Highlights 20 Pts vs Galatasaray 02.10.2018. Watch best highlights from Dylan Ennis with 20 points and 2 assists against Galatasaray Instanbul in Eurocup. Morabanc Andora lost on the road 84-73 on 02.10.2018. Zach Auguste Highlights 18 Pts, 5 Blk vs Andorra 02.10.2018. Zach Auguste led Galatasaray to the fist win 84-73 over Morabank Andorra in the Eurocup. Auguste scored 18 points, 5 blocks, 3 assists and 8 rebounds on 02.10.2018. James Feldeine Highlights 16 Pts vs Maccabi Rishon 02.10.2018. Hapoel Jerusalem was defeated by Maccabi Rishon 92-81, James Feldeine scored 16 points and added 3 assists in the semifinal of Winner Cup on 02.10.2018. Nigel Williams-Goss Highlights 22 Pts vs Unics 30.09.2018. Nigel Williams-Goss led Olympiacos to a big win in overtime 91-89 over Unics Kazan, scored 22 points and dished out 3 assists on 30.09.2018 Gomelsky Cup. Pierria Henry Highlights 22 Pts vs Olympiacos 30.09.2018. Checkout Pierria Henry best highlights with 22 points and 3 assists, Unics Kazan lost in OT to Olympiacos 89-91 on 30.09.2018 Gomelsky Cup. Maurice Ndour Highlights 22 Pts vs Olympiacos 30.09.2018. Maurice Ndoure scored 22 points and added 5 rebounds against Olympiacos Piraeus in the Gomelsky Cup. Unics Kazan lost to Olympiacos in OT 89-91 on 30.09.2018. Tarik Black Highlights vs Maccabi Rishon 01.10.2018. Checkout debut highlights from Tarik Black for Maccabi Tel Aviv against Maccabi Rishon, scoring 8 points, 7 rebounds, 2 assists and 1 block. M.Rishon defeat M.Tel Aviv 86-77 on 01.10.2018 winner Cup. Jeremy Pargo Highlights 10 Pts, 5 Ast vs Maccabi Rishon 01.10.2018. Watch best plays from Jeremy Pargo with 10 points and 5 assists against Maccabi Rishon, despite Maccabe Tel Aviv was defeated 86-77 in the 1/4 finals of Winner Cup on 01.10.2018. Vasilije Micic Highlights 14 Pts, 7 Ast vs CSKA Moscow 30.09.2018. Vasilije Micic highlights with 14 points and 7 assists against CSKA Moscow, Anadolu Efes was defeated in the final of Gomelsky Cup 87-83. Daniel Hackett Highlights 12 Pts vs Anadolu Efes 30.09.2018. Checkout Daniel Hackett debut highlights with 12 points and 1 assist in the CSKA win 87-83 over Anadolu Efes in the final of Gomelsky Cup. Nando De Colo Highlights 22 Pts vs Anadolu Efes 30.09.2018. Watch Nando De Colo scores 22 points and 3 assist to help the CSKA Moscow pick up the victory over Anadolu Efes 87-83 in the Gomelsky Cup final. Petteri Koponen Highlights 18 Pts vs Ratiopharm ULM 28.09.2018. Watch Petteri Koponen Highlights from his first game for Bayern Munich, scored 18 points and dished out 4 assists in a road win against ULM 83-77. Facundo Campazzo Highlights vs Iberostar Tenerife 30.09.2018. Checkout best plays from Facundo Campazzo against Iberostar Tenerife, Real Madrid defeat Tenerife 88-73 in the fist game of the 2018/19 season. Sergio Llull Highlights 12 Pts, 5 Ast vs Iberostar Tenerife 30.09.2018. Sergio Llull led Real Madrid with 12 points and 5 assists, Madrid defeat Tenerife 88-73 on 30.09.2018 Liga endesa ACB jornada 1. Anthony Randolph Highlights vs Iberostar Tenerife 30.09.2018. Watch Anthony Randolph Highlights with 13 points against Iberostar Tenerife, Real Madrid defeat CB Canarias 88-73 on 30.09.208 Liga Endesa jornada 1.